Two decades ago I was working at the United States Information Agency (USIA), an independent foreign affairs agency of the U.S. Government. We were separate from the Department of State—the counterpart to the Ministry of Foreign Affairs in Japan, and our primary task was Public Diplomacy. Some called what we did government propaganda. To be precise, the slogan stamped across the agency façade was “Telling America’s Story to the World.” At State it was all about policymaking; at USIA it was all about policy shaping. As a foreign affairs specialist, my work was more artistic than bookish. USIA didn’t need a dissertation defender but a distiller of ideas who could help win converts to the American cause. I wasn’t telling friends and neighbors about my work, not because it was covert, but because our billion-dollar annual appropriation had an overseas target audience, not a domestic constituency. We were funded by the American people but not for the American people. We were comprised of mostly American citizens at Agency headquarters in Washington, and predominantly Foreign Nationals (FN) and Foreign Service Officers (FSO) in the field. It was the field that mattered most to Washington. We were interested in climate change: How can we create an overseas climate for U.S. strategic economic interests? A continuity thread extended from Eisenhower to Bill Clinton, my penultimate boss at USIA. The Clinton Doctrine of 1993, coming on the heels of the Cold War “win,” referred to expanding and enlarging market-driven democracies that would work with the United States for mutual benefit. USIA’s principle function was to smooth the path to that goal—to build mutual understanding, that is, to explain why doing business with the United States was more of a win for all than a win just for us. We were challenged when the Agency experienced a lot of pushback from labor unions and workers opposed to the North American Free Trade Agreement (NAFTA). NAFTA would eventually pass while its much more ambitious successor that few have heard about, Trans Pacific Partnership, languished. Anthony Lake, President Clinton’s national security advisor, came up with the one word slogan, enlargement, that defined the Clinton Doctrine: “Throughout the Cold War, we contained a global threat to market democracies: now we should seek to enlarge their reach.” The containment to enlargement rhetoric impressed. Economic competitiveness was at the heart of Clinton’s foreign policy vision, not human rights and constitutional democracy for all. As presidential historian Douglas Brinkley observed, Bill Clinton was more interested “in helping Toys ‘R’ Us and Nike to flourish in Central Europe and Asia than in dispatching Marines to quell unrest in economically inconsequential nations.” We saw this preference from Somalia to Bosnia. My years working for Bill Clinton and the Clinton Doctrine remind me of what the Shinzo Abe administration faces today. Both politicians won elections repeatedly on perceived competence in improving economic conditions for their respective countries. Neither was elected or reelected based on foreign policy prowess but economic promises. As much as Clinton wanted his legacy to be the free trade and market democracy president, his last few months in office coincided with Al-Qaeda’s attack on the USS Cole in Yemen. Seventeen U.S. soldiers were killed. The Clinton pledge for a growing middle class in democratizing countries who wanted to buy U.S. goods and services was halted. He wasn’t thinking about how to market Toys ‘R’ Us but how to contain a new security threat to his hoped for new world order, which Clinton’s Republican predecessor George H.W. Bush had first promulgated in 1991. Long after USIA was abolished as an independent agency and its successor elements were absorbed into the State Department, security and counterterrorism became the resource-rich cornerstones of U.S. foreign policy, not economic competitiveness. Clinton’s marketplace idealism is a nostalgic memory overshadowed today by foreign policy snuff films on YouTube marketed like movie premieres on Twitter feeds. In 1993 we saw the bodies of mutilated U.S. peacekeeping soldiers dragged through the streets of Mogadishu, Somalia, on the nightly news, not on constant Internet feeds. Even then, such images influenced foreign policy behavior, including administration reluctance to militarily intervene in Bosnia. 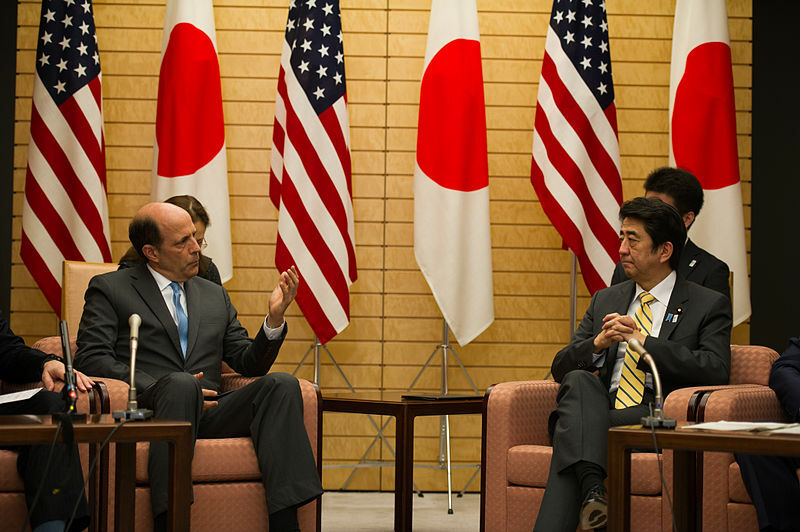 The lessons for Abe are manifold. 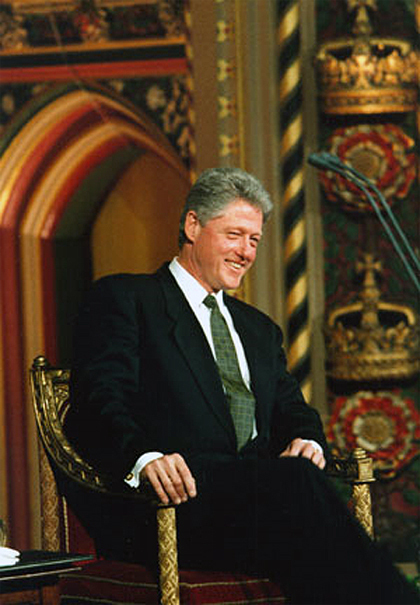 President Clinton had a bold vision for the United States that did not match global realities. His optimism about the world embracing U.S.-style market democracies clouded his ability to prepare the American people for the possibility that we weren’t as admired and loved for who we were, what we stood for, or how we acted on the world stage. The end of the Cold War unleashed a lot of pent up frustration that no Starbucks opening would resolve. I can still recall Thomas Friedman presenting his “Golden Arches” theory of conflict resolution (aka McDonald’s theory), an outgrowth of the Clinton Doctrine vision and Friedman’s popular 1999 book, The Lexus and the Olive Tree. “No two countries that both had McDonald’s had fought a war against each other since each got its McDonald’s,” Friedman stated in his book. In foreign policy today—especially the open-sourced, open-marketed version we now know as modern public diplomacy, small is beautiful, nimble is necessary, and bold can be risky. 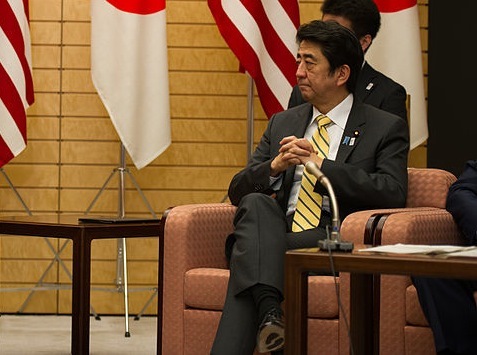 The Abe Doctrine combines two slogans (a) Beautiful Japan with (b) Bold Japan. One is culture-centric, with Cool Japan pop and flash and refined visions of delicious cuisine, temples, Zen gardens and public service excellence and politeness; the other slogan is security-focused and steeped in postwar history with far darker pictures in our heads. It’s hard to reconcile the two. Beautiful Japan, peaceful Japan, whose Self-Defense Forces have never harmed a soul, needs some quiet contemplation to consider all of the issues on Abe’s plate. The policy plate is overflowing and it confounds, not just the Japanese people, who so far have been politely conciliatory in voice and protest, if not in opinion poll. Overseas and in foreign media, Japan’s global image is a head-scratcher. For forty years, USIA took the path of less resistance—telling America’s story—as its slogan. Then Clinton upped the ante and said the U.S. was open for business and ready to invest in U.S.-friendly nations around the world. It all seemed so simple then, a McDonald’s restaurant just around the corner. The Abe administration just announced a trip to Washington this spring where Abe will address a joint session of the U.S. Congress. This is bold. And what will Japan’s slogan be then? I’m only certain of one thing. It will surely be timed to coincide with Washington in cherry blossom splendor. Dr. Nancy Snow is an Abe Fellow and Visiting Professor at Keio University completing a book on Japan’s global image and reputation since 3/11. She will give a dinner talk, “Promoting Japan’s Global Image and Reputation” this Friday, February 27, at an event sponsored by the Forum for Corporate Communications (http://www.fcctokyo.com). So much for de-mocracy in Japan! Brand Abe doesn’t even allow repeat of free speech. Brand Abe forced Reuters News Agency to remove my comment within 24 hours of posting.